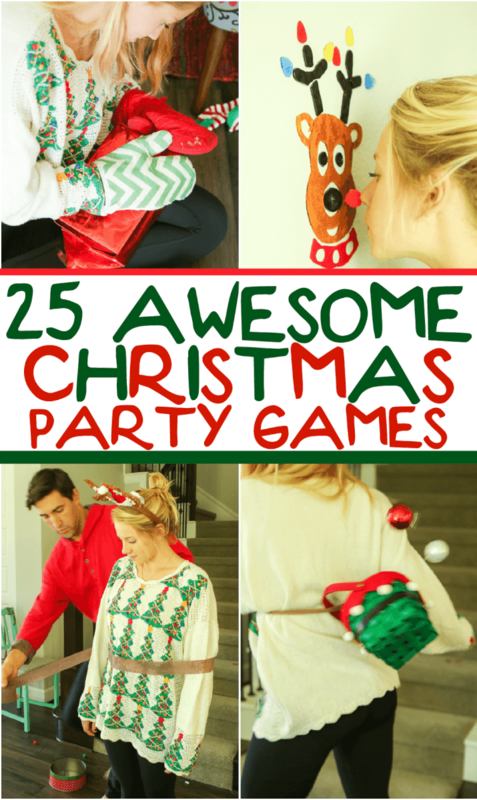 These Christmas games are perfect for any holiday party! Easy Christmas party games you can play with things you’ll likely find around the house and that everyone will love! No need to play all 25, pick a few of these Christmas games for kids and a few Christmas games for adults, and you’re all set for one festive holiday party! Last year I hosted a goodbye to Elf on the Shelf party and during that party we played a bunch of minute to win it Christmas games. These Christmas party games work for any ages and are guaranteed to make your next Christmas party a huge hit! If you’re looking for something less active, these aren’t for you but this Christmas scavenger hunt might be! I created 25 Christmas games to play but you could easily just pick out a handful! And if you need more, here are some 12 days of Christmas inspired minute to win it games! Here’s the full list but make sure to keep scrolling for details, instructions, and free printables (if they need them!). And make sure to watch the video below to list to see how fun these games are!! All of these games are Minute to Win It style games and depending on the number of people playing, there are different ways you can play them. Don’t know what what minute to win it games are? Start with my minute to win it games page that’s full of instructions, scoring ideas, and more! Note: If any of these challenges seem to easy or too hard for the group you’re playing with, feel free to adjust slightly. Eat an entire bowl of mini marshmallows and drink a cup of hot chocolate in a minute (or race to be the first). Tie a piece of ribbon or twine from one post or chair to another. Players must stand on top of the chairs and try to be the first to drop a candy cane from the chair onto the ribbon and get it to stay there. Play until the first player gets a candy cane to catch on the ribbon or see who can get the most in a minute. This is one of the more difficult Christmas minute to win it games for kids. Players must pass small toys or ornaments under their legs like they’re hiking a football and have a teammate catch them in a small Christmas basket that’s attached to the second player’s back. Teams race to be the first team to catch five or see who can get the most in a minute. Players have a minute to try and toss mini plastic elves into a line of buckets (one 5″ away, one 7″ away, and one 10 feet away). Player has to make elves into each of the buckets in the time to win. Decorate white ping pong balls to look like snowman faces. Fill an empty tissue box with the snowmen ping pong balls and tape the tissue box (or use a velcro belt glued to the box) to someone’s backside and the player has to shake all of the snowmen out of the tissue box before the time runs out. Or if you’d rather not decorate like snowmen, use ornaments instead. Player have to pop 10 balloons using just their hands with winter gloves on before the time runs out. We did this in our Avengers party with hulk gloves, and it was absolutely hilarious! Definitely one o the most fun minute to win it Christmas games for adults! Before the party, fill five boxes with different amounts of jingle bells than wrap like holiday presents. Player has to shake wrapped presents filled with jingle bells to determine how many jingle bells is in each, putting them in order of the most jingle bells to the least. Set out bowls full of red and green candies, making sure to have the same amount in each one. Players must quickly go through a bowl of red and green candies and divide the candies (one candy at a time) into separate bowls across the room labeled naughty or nice. Red candies go into the naughty bowl and green candies go into the nice bowl. Players have to wrap a teammate from head to toe with brown crepe paper and top with reindeer headband to finish the challenge. If player breaks crepe paper, they can continue wrapping to cover them completely. Player has to bounce (or toss) white ping pong balls into an empty fish bowl at the other end of the table while other players are throwing cotton balls at the ping pong balls the player is bouncing, trying to knock their balls out of the way. Player has to bounce one ping pong ball into the bowl to win. This is one of my absolute favorite minute to win it Christmas games! Give each player a red pom pom and a spoonful of vaseline. Players have to race to be the first person to put a red pom pom on Rudolph’s nose (make sure to put a bit of vaseline on his nose as well) on the other side of the room. To play, players must dip their nose into the spoonful of vaseline then get the red pom pom to stick to the vaseline on their nose. Once the red pom is on their nose, they must move across the room and stick it to Rudolph’s nose. The catch? They can’t use their hands at any time. Before the party, hide mini Santa or Christmas figurines (at least one for each player) all through the house. To play, players must race to search the house to find a mini Santa. This one would be great to play as a team relay, have one player search first and when they find one, they tag the next player who searches. Either the player or team to find Santa first wins. Give each player an ornament and a gift box and have stand behind a lined taped on the ground with painter’s tape. Tape another line across the room (best done in a large empty room or gym). To play, players must fan their gift box toward their ornament to get it to roll across the room and over the other line. Players can’t actually touch the ornament with the box, just use it to create wind to “blow” it. Hang a thin Christmas ribbon or strand of garland across two chairs or posts, low enough to the ground that players can reach it with their feet if they’re sitting on the ground. Give each player plastic mistletoe, two for kids and three to five for teens and adults. To play the game, players must race to be the first to hang the mistletoe on the ribbon using just their toes to hold it. Pick up a handful of mini Christmas trees and place them in a line on the floor. Give each player a bucket full of plastic ornaments that have hooks on them and have them stand on a line of painter’s tape 10 feet away from the mini trees. Players race to be the first to trim a tree by tossing ornaments from the line to try to get them to hang on the tree. First one to get five ornaments on their tree wins. Before the party, put little stickers on the bottom of Hershey kisses – some mom/woman stickers and some Santa stickers. To play the game, set out the Hershey kisses in a grid (lined up). To play, players must pick a Hershey kiss from the grid and look at the bottom. If they pick a kiss with a mom or Santa sticker on the bottom, they hold on to it and pick another Hershey kiss. If they pick one with no sticker on the bottom, they must eat the Hershey kiss and pick another one. Players continue picking Hershey kisses until they find a kiss with a mom and a kiss with a Santa on the bottom. Place five ball ornaments lined up on the end of a table and give the player 10 jingle bells and have them stand on the opposite end of the rectangle table. To play, players must roll their jingle bells from one end of the table and attempt to knock off all five ornaments from the opposite end of the table. Give each player a plastic spoon and a cup full of cotton balls. On the other side of the room, place an empty bowl for each player. Players must race to get 10 cotton balls from the cup to the bowl on the other side of the room, using just the plastic spoon. The plastic spoon must be held in the player’s mouth. If they drop a cotton ball, they should leave it and go back and get another one. Give each player two large rolls of white streamers. Players must hold one roll of streamers in one hand and one in the other. When the timer starts, players have to try to unroll both rolls of streamers, however they can. The only rule is that they cannot use their hands other than to hold the streamers. Get cheap wreaths from Amazon or the dollar store and have players try to toss them onto empty paper towel rolls glued onto Christmas colored poster board. To win, players must land two wreaths on their toilet paper roll. Hang stockings (1 for each player) from a ribbon or rope tied tightly across from two posts or chairs. Give each player a bucket full of ping pong balls, preferably of different colors then send them across the room from the stockings. Players race to be the first to bounce the ping pong balls into the stockings from across the room. If you have multiple colored ping pong balls, players can shoot for any of the stockings. If you’re using all white ping pong balls, I recommend assigning everyone to one stocking to make it easier. Give each player a hula hoop and set up one gift bag per person on the other side of the room. Players must roll their hula hoop down the hall and try to get it to land around the gift bag (make sure they’re heavy!). First player to get their hula hoop to land successfully around the gift bag wins. If they miss the gift bag, they must run down and get their hula hoop and run back. Or make it more difficult and make them hula back. Give each team a list of Christmas songs that everyone other than one person on the team can see. Teams must race to be the first to get their “guesser” to guess the title of all of the Christmas song titles on their list. Teams can work together like in reverse charades to act out the song title but no words, no singing, and no sign language. It’s speed charades. You can either do the first person to get through the entire list or first team to guess like five of the songs on the list. Give each team a bucket filled with Christmas trinkets, including items associated with the 12 days of Christmas (e.g., partridge, doves, gold rings, etc.). Make sure that there are all of the items for the 12 days as well as other items to confuse the teams. Have teams stand at one end of the room and put a bucket per team at the other end of the room. When you say go, a team member must run to the bucket and find something that fits ones of the 12 days of Christmas and bring it back to their team. Players rotate like a relay, going to the bucket until they find something for each of the 12 days. I recommend giving them a list of the 12 days to check them off as they go. Before the party, wrap up a a bunch of small boxes (about 5 person team playing) and inside some of those, put a small piece of paper with a picture of Santa on it. In the other boxes, put a small piece of paper with nothing on it. To play, players have to choose one present from the table and unwrap it with oven mitts on their hands. If the present has a Santa inside, they’re done. If not, they have to choose another present and continue unwrapping until they find a secret Santa. Want a printable list of all of these games? Enter your email address and first name in the form below! If the form is not showing up right below this, click here to get to it. I have an entire collection of awesome Christmas games – so many you’re guaranteed to find something for the party you’re looking for! can’t wait to start Christmas! Your welcome! Have so much fun! This is a GREAT list of games! Well Done. We will be taking some of the games to a shelter on Christmas Day to play. Great ideas, yes please I’d love a printable version of this! If you go to the bottom of the page and fill of the form. You will be taken right to the printable version of the games. I would love to print these. With an extended family with young kids, these look to be modified so both young and old can play.